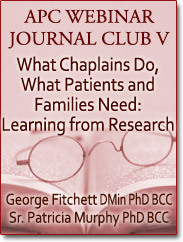 v5WJC Session 4, Interfaith Spiritual Care: How Do Chaplains Practice It? Respect for the beliefs of the patients and families for whom we care is a key element of our code of ethics. An interfaith approach to spiritual care is taken for granted by most chaplains. However, little is known about how chaplains enact interfaith spiritual care, and some observers question whether "generic chaplaincy" is possible or effective. Using an ethnographic method, the authors of this paper describe two approaches chaplains use in their interfaith care. When you read this article, ask whether it describes th way you and your colleagues approach interfaith spiritual care. If not, what have these authors missed? Additionally, what evidence do we have that our current approach to interfaith spiritual care is effective or not? 1. To inform chaplains about the debate regarding generic chaplaincy and its effectiveness. 2. To help chaplains critically reflect on their approach to interfaith spiritual care. 4. To help chaplains develop and maintain research literacy, including the ability to critically read research and where appropriate apply the findings in their professional practice. Reading: Cadge & Sigalow (2013). Negotiating religious differences: the strategies of interfaith chaplains in healthcare. Journal for the Scientific Study of Religion, 52, 146-158. Format: APC-sponsored course, presented as five bi-monthly 60-minute webinar sessions. Continuity: While there is a common theme for all the articles in the series, each session is complete in itself, so participants may choose one, several, or all five sessions. Audience: The series is designed to help chaplains with no prior experience learn to read and understand research. It will also introduce research-literate chaplains to important research about spiritual needs and chaplains activities in response to those needs. Preparation: The articles selected for the series are made available, and participants are strongly encouraged to read them and complete their own summary reviews of the studies in preparation for each webinar. A form is provided to help participants create their own summary reviews. When you purchase this webinar recording, you will receive a PDF file with links to watch the recording and access supplemental materials directly from our web page. You'll be able to hear and see the complete presentation, including Q&A with audience.